A sixth-plate ambrotype from the Herb Peck Jr. Collection pictures a jaunty soldier from a heavy artillery regiment wielding a five-string banjo and a .32 caliber rim fire Allen & Wheelock side-hammer revolver. The editor dedicates this issue to Herb Peck Jr., who has contributed numerous fabulous images but has never written a story. Letters include congratulations for the recent Confederate and Wolverines issues, and a request for help to find a photo once reported to have hung in the Museum at Chapultepec Castle in Mexico City. Five publications are mentioned, including The Third Day at Gettysburg & Beyond (University of North Carolina Press) edited by Gary Gallagher, Ironclad of the Roanoke: Gilbert Elliott’s Albermarle (White Mane Publishing Co.) by Robert Elliott, Riding with Stuart: Reminiscences of an aide-de-camp (White Mane Publishing Co.) edited by Robert Trout, Treatise on Tactical Use of the Three Arms: Infantry, Artillery, & Cavalry (Brandy Station Bookshelf) by Francis J. Lippitt and Andersonville: The Last Depot (University of North Carolina Press) by William Marvel. A profile of the Louisianan’s life and military service is illustrated with a quarter-plate ambrotype portrait. This survey includes four images with the same painted canvas backdrop. Evidence suggests was made by a photographer attached to the Army of the Potomac until June 1863. A survey of 26 portraits features a variety of handguns, including the 1861 Remington Army, Colt Navy, a .22 caliber Manhattan rim fire, a Whitney-Beals pocket revolver, a Model 1858 Starr Arms Company double action revolver, a Savage Revolving Arms Company navy model six-shooter and more. 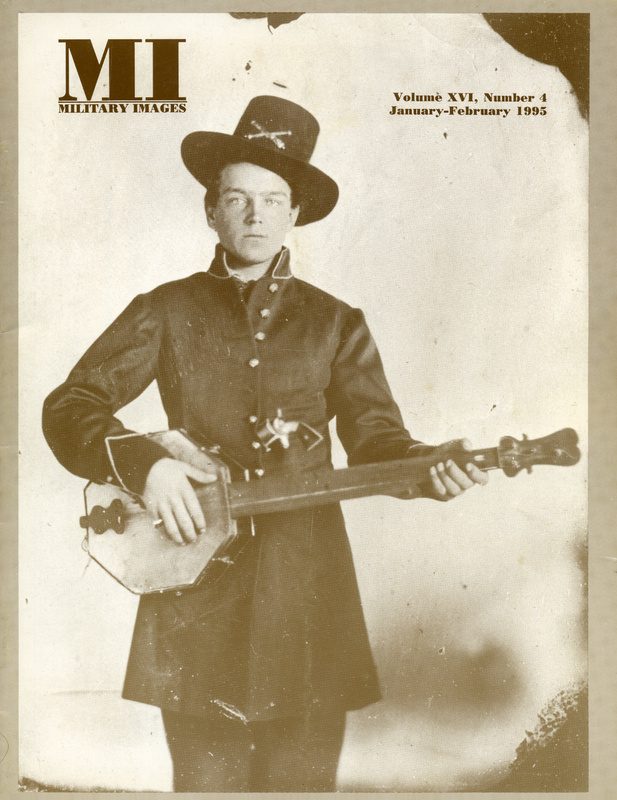 A carte de visite of Ohio National Guardsmen in Akron is the focus of this photo analysis. The soldiers, who belonged to the 54th Battalion, Ohio National Guard, are shown in the streets of the city. A modern view of the same location is included. Brothers Joseph and George Otto and their cousin Delos served in Company G of the 150th Pennsylvania Infantry. Only George would survive the war. Joseph died of typhoid soon after he enlisted and Delos was killed in action during the Battle of The Wilderness on May 5, 1864. Five Hussar portraits represent soldiers from armies in the Union, Britain, Germany and Austro-Hungary. A biography of Rev. James Cook Richmond of the 2nd Wisconsin Infantry is illustrated with his portrait. Described as a “man of many parts,” by the author, Richmond had a penchant for writing obscene letters to ladies. In the spring of 1861, four members of the 7th South Carolina Infantry posed for their portrait in the studio of Charleston, S.C., photographer Charles J. Quinby. The quartet was 3rd Lt. George James Strother, Lt. Richard Coleman Strother, Pvt. John Coleman Strother and Capt. William E. Clark. The author provides brief accounts of each man’s military service. In “‘Gosline’s Pennsylvania Zouaves’ (95th Infantry Regiment),” McAfee explores the uniforms and history of this organization. The narrative is illustrated with a portrait of Sgt. Michael Lawn of Company K.
Solo photos of the humorous and the unusual from the collections of our readers includes a company of the 7th New York National Guard with muskets raised, a Union soldier with tartan stripes on his collar, a drum major at the Naval Academy and a soldier from the 37th Wisconsin Infantry with unusual striping on his uniform coat. A sixth-plate tintype from the Roy Mantle Collection pictures an infantryman in front of the “Withered Tree” backdrop.